This has been a year to cull. But, I can't cull and just toss. Oh some stuff I can but when it comes to something like cologne, I can't. I'm not sure why. I have no emotional attachment to the stuff in the drawer, it's just not something I want to give away. After doing a cologne test, I rounded up all the little packets and used those up. It took from March to June to dispatch the stack. There were a lot of them. Now, I don't wear cologne on the weekend unless I'm going to be going out for something other than errands or to work in the back yard. It's mainly at the office or events or meetings where I wear a splash of something. Once the packets were used up, I decided it was time to work on the small tubes of fragrance. Wednesday, I finally used up the scent to the right. It was a rather long tube, 2 inches long, fill with fragrance. I started wearing it on July 2nd; I wrote the date down on the card. With my self-imposed usage boundaries, it took 2.5 months to use up 2 inches. It wasn't an unpleasant scent. Truth, which came out in 2000, is classified as "refreshing, oriental and woody". Meh, I don't know about the woody part. Woods don't smell like that where I'm from. As with the Michael Kors sample that I got which started this all, it's not something I would spend $40 on, even for a designer bottle. Recycle both the card and the cologne container and open the next package. 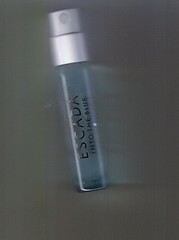 This one is Escada, "Into the Blue". Created in 2006, this supposedly has blue waterlily and star fruit as the base with peony and "wet woods", whatever that is, rounding out the scent. I wore it for the first time today. I'm not sure I smelled the woods part, but the flowers, yeah. What I really like about this is the bottle. Look at that. It's a spray bottle. The biggest problem with these little demonstrator bottles is that they have this small top, the size of a pencil eraser crammed into this glass bottle. Make no mistake. Those little bottles are glass. I've broken enough of them to know that. The plastic stopper has to be tight to prevent evaporation since a cologne's ingredients are suspended in alcohol. Getting that little stopper out without spilling the entire contents or even part of the contents on you is always an exercise in probability. "Am I feeling lucky?" Spill. "I guess not." With this tiny spray bottle, I won't ever spill it all over my hands or the top of the dresser as I go to apply it. Actually, I don't really care what the cologne, which is a light blue, smells like. I just like using the spray bottle.